ACS is an authorized dealer and installer of the DSC (Digital Security Controls) Products. 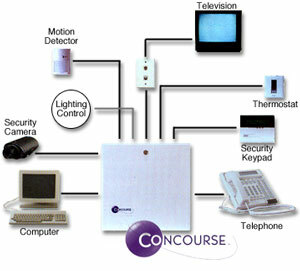 We are proud to offer Concourse Home Wiring Systems. We can design and install a custom system with components that work together for maximum performance. Concourse offers all these services in an expandable, scalable package; designed to meet your family's changing needs. Why a Consourse Integrated Home Wiring System? Safety. A Concourse system can alert your family to intrusion, or be set up to light the way out in case of fire. Trust. When it comes to home security and automation, we're building quite a reputation. In fact, DSC (Digital Security Controls) has been helping people feel more secure, as well as improving and simplifying their home lives for years. Convenience. Our Concourse Integrated Home Wiring System gives you convenient control of your home's individual systems for today, and expands to give you the ones you may want or need in the future. Value. When you have a concourse Integrated Home Wiring System installed, you will increase the value of your home, and even save on your utility bills. Structured wiring is a system of cables, jacks and a distribution cabinet that allows independent systems such as telephone, cable TV, computers, security systems and more to be integrated into one system, for more intelligent and coordinated operation. How much does a structured wiring system cost? The cost is dependent upon several factors including the length of the cable runs and the number of modules included. We offer a basic package for $695.00*, which includes 4 Cable TV locations, 4 Telephone locations, 4 Data locations and basic Security pre-wire. *Price for homes less than 2000 sq. ft.
For more information about our Structured Wiring Services contact ACS at 252-355-4355 or visit DSC's Concourse web site.